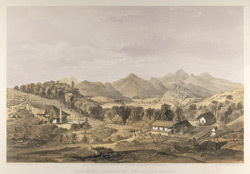 Lithograph by Jonathan Needham (fl.1850-1874) after Charles D.C O'Brien, of Peacock Hill Coffee Estate in Sri Lanka, dated 1st January 1864. This print forms plate 10 of 'A series of fifteen Views of Ceylon illustrative of Sir J.E. Tennent's work, from sketches made on the spot by Capt C. O'Brien, late Assistant Surveyor General, Ceylon', London 1864. The text accompanying this image reads, "Our view is taken in the 'Peacock Hill' estate, the property of Baring, Brothers near Pusilawa. On the left is the superintendent's bungalow; through the coffee are seen the stumps of the larger trees of the felled forest. In front of the stove are the drying grounds, on which the 'parchment' coffee is spread. The coolies are seen carrying their loads up the steps of the 'pulping-house', in which is the machinery, turned by a water-wheel; a little removed is the 'clerihew' stove, in which heated air is drawn through the parchment...In the right foreground is a dam, by which the water of a small stream may accumulate at night to work the machinery during the day. Over a belt of the standing forest is seen the town of Gampola..." The British began a plantation-based economy in Sri Lanka in the 1830s and their coffee experiment took off with resounding success. The booming coffee industry was ruined when a leaf disease spread through the plantations by the 1870s. The plantation owners looked for a substitute crop and found tea a suitable replacement.